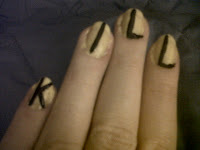 For a friend’s birthday recently, I dressed up as the villainous Elle Driver from Kill Bill (Tarantino, 2003) and of course needed the nails to match. These are very easy, and were done with wooden toothpicks (pre-nail pens). I began with the usual clear coat for the base. I chose a strong yellow and painted several coats to get a solid block colour. 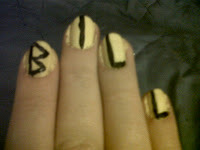 After waiting for them to dry, I dipped a wooden toothpick into a black varnish. I then stroked on all the straight vertical lines, before carefully adding the angled lines of the ‘K’, the ‘B’ and the ‘L’s. Once dry, I went back over them all to get a solid line. And a final clear coat to cover and protect. With pens or a steadier hand than mine, straighter edges would be easily achieved of course. 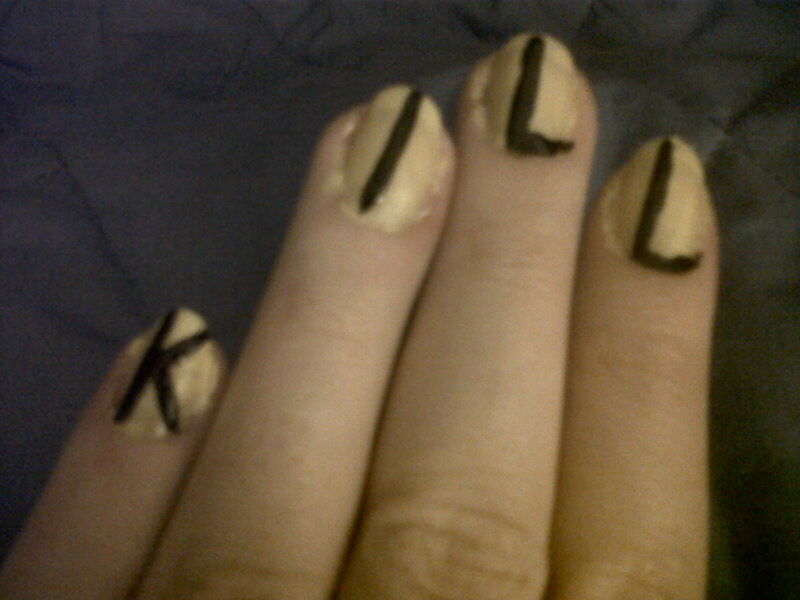 I experimented with several variations on the yellow and black style, although I was Elle Driver it’s still recognisable as being Kill Bill. There are many different film themes you can have a go with! I’ve done a few more, so will post those soon. As a film student, it’s one of my favourite genres to have a dabble in!